First there was Star Trek: The Next Generation. Now there’s Dr. Moscowitz: The Next Generation. 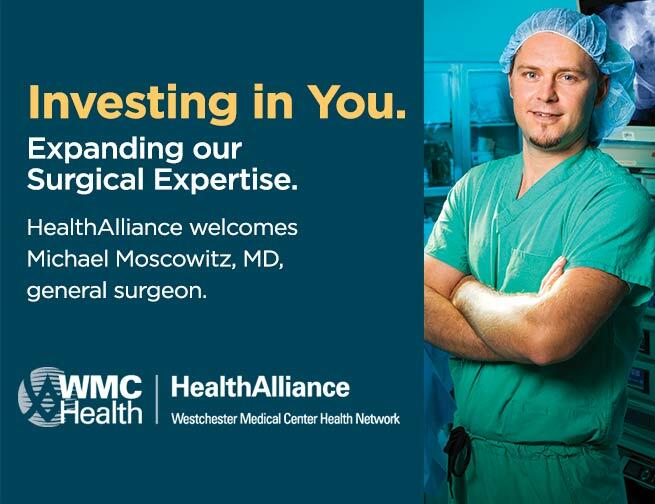 The next generation is Dr. Michael Moscowitz, a general surgeon newly practicing at HealthAlliance Hospital: Broadway Campus. He’s the son of longtime Kingston orthopedic surgeon Dr. Richard Moscowitz. “It’s good to be back,” says the younger Dr. Moscowitz, 31, who went to Kingston High School and studied medicine and surgery at Chicago Medical School. He did his general surgery residency at New Jersey’s Morristown Medical Center. His wife of six years, Kara, also 31, is from Saugerties. She’s a registered nurse by profession, working fulltime as the mother of Ella, 5, and Liam, 3. The family also has Daisy, an 11-year-old beagle sheltie mix that Michael and Kara rescued in Chicago seven years ago. As a board-certified general surgeon at HealthAlliance, Dr. Moscowitz focuses on the abdomen and its contents, including the stomach, small bowel, colon, liver, pancreas, gallbladder and bile ducts. He also deals with diseases involving the skin, breast and soft tissue, as well as trauma, emergency surgery, peripheral vascular surgery and hernias. He also says he’s taking advantage of HealthAlliance’s leading-edge technologies to perform advanced minimally invasive surgery. “Continual innovations in minimally invasive surgery make it useful for an ever-expanding list of procedures,” he says. The new HealthAlliance Hospital will be a regional hospital of choice, providing an optimal environment for the highest-quality care. It will be recognized for its high patient satisfaction, awarded for its exceptional clinical outcomes, and privileged to have the finest physicians and employees. The medical village will be an innovative focal point for the city’s health and related needs. Current partners will offer primary care, behavioral health and other support services. Compatible retail shops will provide additional amenities. The village will also have a medical simulation center for state-of-the-art medical training for current and future healthcare professionals, providing cutting-edge technology to improve healthcare training and delivery. “I see myself staying here for the rest of my life,” he says.